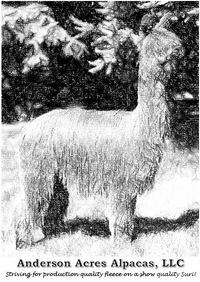 Openherd: Anderson Acres Alpacas, LLC - Get great deals on alpacas in Openherd auction lots! Can be hung as art! 61.5 DENSITY AND TOP 5% EPDs! Striving for production quality fleece on a show quality Suri!